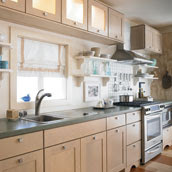 Thanks to our Twitter friend @kitchenviews, we were turned on to this 2009 article with some pretty great, and easily applied design tips for small kitchens. Many of these ideas we apply to AK kitchens of ALL sizes - things such as custom cabinetry (shelving & roll-outs) and playing with color and contrasting elements. Thanks to Gold Notes for the great post, we're happy to share it! Small kitchens never seem to have enough cupboard space for all the items their owners want to store. After carefully culling to make sure you're only storing regularly-used cooking, meal preparation and clean-up gear in your kitchen, you can increase your storage capacity in several ways. Backsplashes offer dozens of square feet of untapped storage potential. Usually considered only for decorative purposes, these 18 inch spans between your countertops and wall cabinets can be put to great use as zoned, organized storage. For example, you can clear some counter space by installing a backsplash-mounted utensil crock near your cooktop. You could also mount a spice organizer in your meal prep zone, freeing up some cabinet storage. Backsplash organizers, like these from Ikea, take advantage of untapped space in your kitchen and free up countertops and cabinet space. Even small kitchens typically have an unused wall or ceiling space above a peninsula that can be tapped for additional storage. 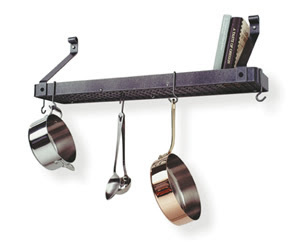 By adding a pot rack to your kitchen, you can free up base cabinet space that would otherwise hold your cookware. There are racks available in almost any style and size to accommodate your needs. Small kitchens typically lack islands, but a peninsula housing a cooktop can be a good spot to tap into added storage potential. This wall-mounted pot rack by Enclume lets you take advantage of unused wall space in your kitchen for both hanging and shelf top storage. 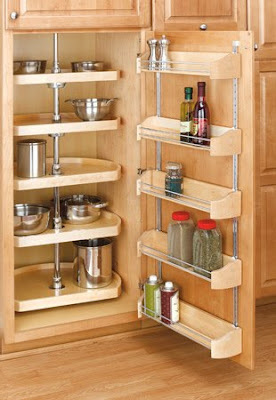 Another way to add organization and storage capacity to your kitchen is to install accessories on the backs of doors. For example, you can hang an organizer for your cleaning supplies on the back of the cabinet holding your sink. 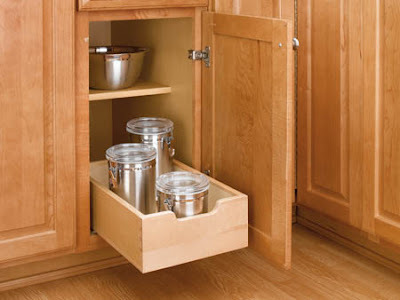 Additionally, you can add pantry capacity by putting a canned goods or food wrap holder on the back of its door. There are numerous options that can add to your kitchen's efficiency, as well as its storage potential. Increase base cabinet storage by up to 25 percent with roll-out trays. If you have at least eight inches between your wall cabinets and your ceiling, you can add storage capacity - and style! 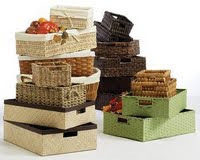 - to your kitchen with decorative baskets. Shelf baskets can easily accommodate small items that you want to keep in the kitchen area, but don't use on a daily basis. They can add a splash of color or neutral texture, depending on the look that works best with your space. Baskets can add style and storage to your kitchen in a wide range of colors and textures. This selection is available at Michael's. Compact kitchens tend to look smaller and choppier when there are too many colors and patterns running through them. Minimizing contrasts, on the other hand, makes them feel airier and spacious. You can achieve this effect by selecting solid-colored countertops, for example, and maple or painted cabinets, rather than oak, hickory or glazed finishes. 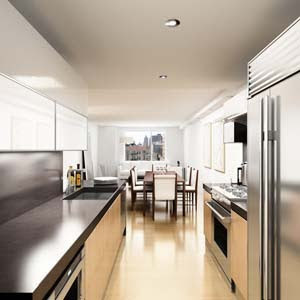 This New York City condo kitchen looks larger because its base cabinets match its flooring and its countertops, appliances and wall cabinet frames all coordinate to minimize contrasts. Replacing solid door fronts on your wall cabinets with glass fronts can also make your small kitchen look larger and brighter. To enhance the space-enhancing effect, you can paint the insides of your cabinets the same color as your walls. This kitchen by Westlake Village, Cal. designer Laurie Burke looks larger and brighter, thanks to its glass-fronted wall cabinets. Kitchens look better - and bigger! - with great lighting. When I take on a kitchen design project for my clients, I always look for every opportunity to add lights to the space. This includes ceiling-mounted fixtures or recessed cans, under-cabinet lighting and, where applicable, island or peninsula lighting. 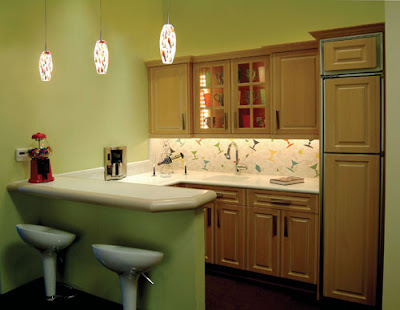 Sometimes, above-cabinet and in-cabinet accent lighting are also applied. This layered approach to lighting makes working in the space easier and safer. It also enhances the beauty of your countertops, cabinets and flooring. This small kitchen by Arlington, Va.-based Kitchen & Bath Factory features three layers of lighting, plus natural rays streaming in the large windows, to enhance its beauty and spaciousness. Open shelving can make a small kitchen feel larger, too. It also shows off your pretty serve ware, making it a well-deserved element in your room's style. One other organization benefit offered by open shelving is making it quicker and easier to find things in your kitchen! 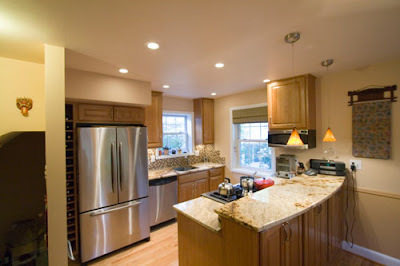 Small kitchens like this one look larger with open shelves, rather than closed wall cabinets. Countertops loaded with accessories and other items will make your kitchen look cramped and cluttered. That's why real estate agents always advise you to minimize what sits on your tops when you list your home for sale. Larger kitchens are more appealing to home buyers - and homeowners! The backsplash system, storage baskets and door organizers will help in reducing countertop population. So will prioritizing the small appliances that need to remain accessible. For example, if you only serve coffee when guests arrive, keep the coffee maker in a remote storage area when you're not entertaining. Minimal countertop clutter makes this petite kitchen from the National Kitchen & Bath Association Inspiration Gallery look larger! Nice sensible styles for small kitchens renovation. To apply these styles we give our small kitchens great or well-spaced look. Rollin cabinet is a beautiful and informative idea you give all. Awesome Tips! Thanks for sharing your knowledge on how we can maximize storage capacity in our kitchen. This would definitely help me a lot since I'm planning to renovate my kitchen next month. Good Job! Thanks for your comments, Marc! We're so glad you liked our tips and that you're undertaking a remodel of your own. Are you in the Atlanta area?